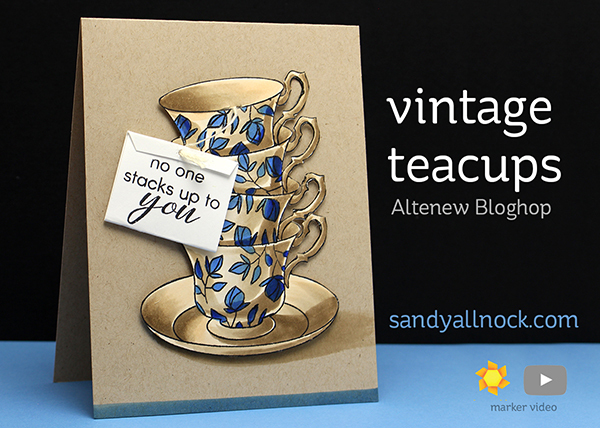 When Altenew invited me to be part of this hop – and I saw the Vintage Teacups set – I wanted to color a set of pretty teacups right away, so I chose that one! (Big thanks for sharing stamps with me so I could join in!) I got out my masking tape from Judikins to create the stack of teacups and nested them into each other. See the video for how that worked with positive and negative masks. Watch the video below or click HERE to see it in HD on YouTube! To celebrate this release, Altenew is offering some prizes…. A $50 gift certificate to THREE lucky winners! Please leave a comment on the Altenew blog by Monday, November 21st at 11:59 PM ET for a chance to win. 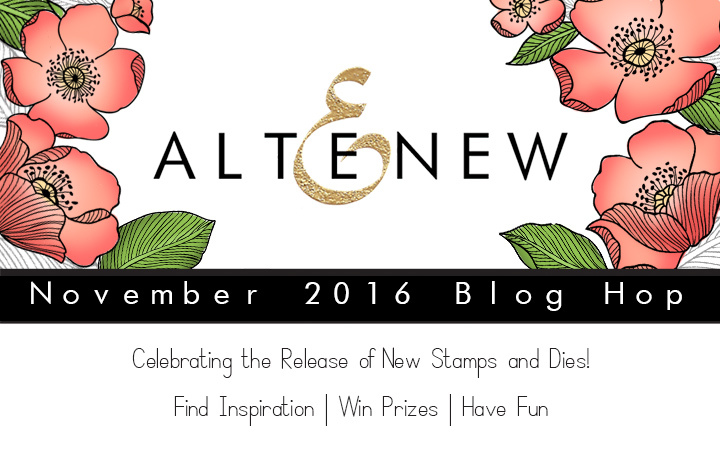 The winners will be announced on the Altenew blog on Tuesday, November 22nd. A $30 gift certificate to one of MY readers! The winner announced here on my blog on Tuesday, November 22nd. And Altenew is also running a special promotion! Place an order with Altenew and receive a FREE You Make Me Happy Stamp Set! No need to add to cart, limit one per customer, while supplies last. No minimum purchase! Offer ends on Thursday 11/17, 2016 at 11:59pm ET. Really beautiful composition and coloring! What a beautiful job u did on these cups!! So pretty and the shading and the colors you used are spectacular!! You are so talented!! I love all the shading you did on this card! This card made me cringe! Hold on…Hold on! It made me sad to see such elegantly crafted tea cups stacked like that! They could chip! You see, I love tea cups (and tea!) I have a collection from my Bridal Shower. We had a tea party and everyone brought a different tea cup/saucer or tea pot as the gift! I love having all different cups, because I can choose which cup fits my mood that day! It was a wonderful day! Dresses and hats and all of the pastries and refreshments had some type of chocolate in them. I still receive tea cups as occasional birthday or Christmas gifts! I really want to grow my collection of tea cup stamps! I love how beautifully you colored them! I don’t know how you controlled the marker to make the very thin circle on the saucers! These are so lovely! Thank you for this wonderful give-away and thank you to Altenew for such an exciting Release! I love all of the stamps! “Adore You” is my ultimate favorite of favorites. “Hello Sunshine” and the Tea Cups are my 2nd choice–tied! This is very artistic the way you paint and place the cups’ it is so beautiful, is the word you are looking for is LIMOGES’ BECAUSE THESE CUPS WERE MADE IN lIMAGES, I THINK IN THE SOUTH OF FRANCE BUT NOT TOO SURE OF THE SITUATION. You make it look so effortless! Gorgeous! Thanks for the coloring tips. WOW! Such an amazing card, the craft base with this blue flowers just so beautiful and so inspiring!! love this card, I am a tea lover and also collect tea cups so this is such a great card!!! would love to attempt it!